The Phobos program was an unmanned space mission consisting of two probes launched by the Soviet Union to study Mars and its moons Phobos and Deimos. Phobos 2 became a Mars orbiter and returned 38 images with a resolution of up to 40 meters. Both probes suffered from critical failures. 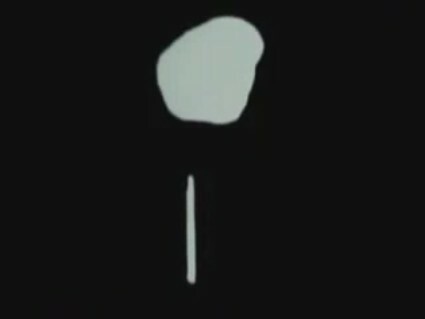 Phobos 1 and 2 were of a new spacecraft design, succeeding the type used in the Venera planetary missions of 1975-1985, last used during the Vega 1 and Vega 2 missions to comet Halley. Phobos 1 was launched on July 7, 1988 and Phobos 2 on July 12, 1988, each aboard a Proton-K rocket. They each had a mass of 2600 kg (6220 kg with orbital insertion hardware attached). The program featured co-operation from 14 other nations including Sweden, Switzerland, Austria, France, West Germany, and the United States (who contributed the use of its Deep Space Network for tracking the twin spacecraft). Phobos ll arrived in January 1989 and entered an orbit around Mars as the first phase towards its real destination, a small Martian moon called Phobos. The mission was flawless until the craft aligned itself with the moon. 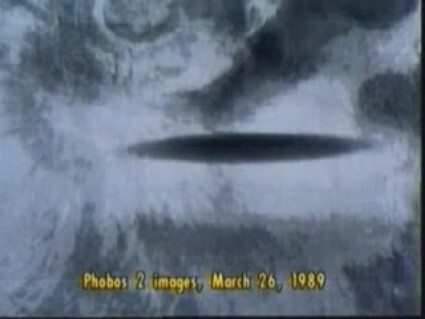 On March 28, 1989 an elliptical object was detected moving towards the satellite seconds before it failed. All indications were that the elliptical object had attacked the satellite which was now dead and left spinning out of control. "Phobos II failed to communicate with Earth as scheduled after completing an operation yesterday around the Martian moon Phobos. Scientists at mission control have been unable to establish stable radio contact." But the next day a top official of the Soviet Space Agency (Glavkosmos) said: "Phobos II is 99% lost for good." It is important to note that he stated the entire satellite was gone and not just contact with it. Of great interest to Ufologists was an image captured either on, or above the surface of Mars. Commonly called the shadow, whatever caused this has never been determined. If it was indeed a craft, it was of immense size. "Phobos 2 Captured Strange Photos of Mars Before Losing Contact With Its Base." Vremya revealed yesterday that the space probe Phobos II, which was orbiting above Mars when Soviet scientists lost contact with it on Monday, had photographed an UNIDENTIFIED OBJECT on the Martian surface seconds before losing contact." Scientists described the UNIDENTIFIED OBJECT as a thin ellipse 20 KILOMETERS LONG! It was further stated that the photos could not be an illusion because it was captured by 2 different color cameras as well as cameras taking infrared shots. One controller at the Kaliningrad control center concluded that the probe was now spinning out of control. It would seem that something struck or shot the Phobos II Probe. In the October 19, 1989 issue of Nature Magazine, Soviet scientists concluded that the craft could be spinning because it was impacted. 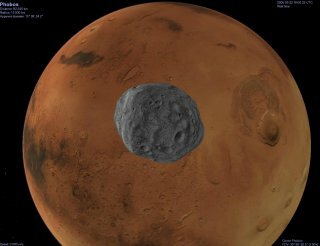 It has long been rumored that Mars and its moon Phobos are alien colonies. The surface of Mars is covered with strange shapes/buildings that do not appear to be natural such as the pyramids, square buildings, runways, etc. One structure shows the face of a man with a helmet looking into space. It can be seen at the National Space Science Data Center, Viking photo with catalog number 76-A-593/17384 Titled "HEAD." Another photo is 070-A-13. There are now eleven Viking photographs (and growing) of this obviously intelligently constructed monument on the surface of Mars. The "HEAD" and other artificial features such as the pyramids were combined by electrical engineer and imaging specialist Vincent DiPietro and a Lockheed computer scientist. The composite images seemed to show that the features on the surface of Mars had been artificially sculpted... Just maybe, WE ARE NOT ALONE!